Molly MacDonald - Dog or Rabbit? I've always been a little confused about Molly and whether she's a rabbit or a Marina-type of dog. 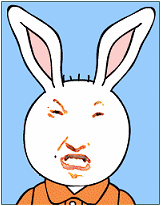 The Arthur Wiki lists her as a rabbit, but if you look at her character design, her nose and ears are identical to Marina's. This leads me to conclude that she's really a dog. James, by contrast, has the more common rabbit nose design that we see in Buster, Ladonna, etc. 2. In the Arthur universe, it's possible for animals of different species to interbreed. In this case, Molly and James are really dog/rabbit hybrids. This could explain why Molly's snout is much shorter than her mother's, and James's ears are more similar to Marina's than Buster/Ladonna's (assuming this isn't just due to him being a young child).